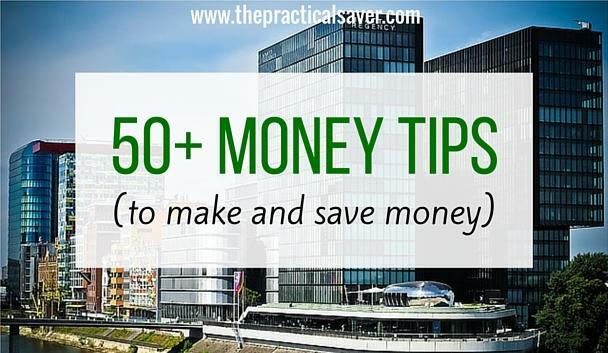 This “50+ Money Tips (for Making and Saving Money)” post contains money tips from some of my favorite personal finance bloggers. I thank them for providing these wonderful insights on how to make and save money. This post contains affiliate links/ads. See disclosure policy. The contributors in this post include Matt of Distilled Dollar, Pamela of My Money Counts, Stefan of The Millennial Budget, Kumiko of The Budget Mom, Rob of Money Nomad, Thias of It Pays Dividends, and Aliyyah of Rich and Happy Blog. This post contains affiliate links/ads. See disclosure policy. It's been almost 6 months since I started blogging. Over the course of that 6 months, I've been giving tips and tricks on how to make money and save money as well. I admit that while I consistently provide these tips and tricks, I am still learning more about money. I decided a couple of weeks ago to pick the brains of my fellow personal finance bloggers. I have to tell you that many of their tips are ones that I haven't thought of. For those who want to learn more about money tips, I highly suggest that you read through the lists noted below. I recommend that you also visit their blogs because their posts are what I consider valuable and substantive. I am a personal finance bloggers but I have to admit that I learn a lot from these fellow finance bloggers. Matt is a Chicago based CPA helping people to extract the vital aspects of personal finance as they pursue financial independence. His site, Distilled Dollar was created as a way to connect with others while sharing in the stumbles and triumphs of building wealth. Eliminate stress and overwhelm by setting up all your bills for autopay. Some vendors will even include a discount for doing this. Take this a step further and automatically deduct from your paycheck the amount of money you put towards investments. By never seeing the money, you’ll avoid the stress when it does leave your bank account. If you’re not already maxing out your pre-tax savings accounts (such as your 401k), then you should consider all of your expenses as being pre-tax. So, if you purchase a $100 dinner, then the true cost to you is closer to $140. You might reconsider investing in our 401k when you see the price tag on everything jumps by 40%. To avoid racking up an expensive bar tab, opt to bring cash when you go out to a bar. I used to leave my credit cards at home on Fridays and bring $40 with me to work. As happy hour wrapped up, I knew I didn’t have the ability to buy a final round or buy an expensive cheese board. Biking leads to more exercise and more money in the wallet. A true win-win. If you haven’t already invested in a bike, then do so immediately. Your return on investment will far surpass that of any other investment you make this year. Not every money saving tips will save you money today. Create a line item in your budget for those expenses that are not necessary at all, and label these, “f-you money”. By being proactive with our budget, we eliminate the guilt and the negative emotions that would otherwise occur when we do buy something expensive. Instead of spending money on going out for a dinner and a movie, take the time to cook a delicious meal at home and rent a movie. My girlfriend and I did this last night and had a great time, We enjoyed the entertainment at about 80% of what it would have cost us had we gone to a movie theatre. Eliminating a cable package is often the first step towards building wealth. The typical cable package can run a family of four nearly $1,500 over the entire year. Instead, opt for online streaming services such as a Hulu Plus bundle with Showtime, Netflix, or Amazon Prime that might cost less than $10 a month. A common theme throughout many societies in the past is that producers are those who are rewarded and seen as being noble, honorable, and having a positive impact on the tribe. Similarly, when you find yourself bored, look for ways to produce instead of consuming. Over time, this small shift can lead to much more wealth as you avoid expensive consumption and can produce goods and services of value to other people. Instead of buying an expensive gift each year for your anniversary or on Valentine ’s Day, opt to create a yearlong memory jar. As the year goes by, for any good memories that are created, write them down and add them to the jar. When the year is up, spend the evening reading through each of the great memories you two shared over the year. Part of the reason people don’t save is because they associate money as something meant to be used today. Start to think of frugality and savings as ways to invest in your future life. Each dollar put in the bank is another piece of your future freedom. Hi I'm Pamela, I'm 30 years old and live in Canada. I created My Money Counts after paying $120k in student loan debt. That experience has made me wiser with my money and on my blog I share some of those experiences with my readers. My Money Counts is a place to share personal experiences with money – debt management, savings, investing, day-to-day living, and more. Even when you are paying off your debt, always make sure that you are also saving. Some may say that the minimum you should save is 5%. Better to double it just in case. Growing your wealth doesn’t happen overnight. Time is as essential as money is. Remember that the early you start, the greater chance that your money will grow. Consult your compounding interest best friend about that. Don’t just pay off your debt or spend your money. Always make sure that you have emergency fund stashed just in case rainy day comes. You’ll never know when it will come. It’s always best to prepare yourself with uncertainties in life. You surely will thank yourself for having an emergency fund. If you consider going to school or going back to school, research for scholarships before jumping into the world of student loans. You’ll be surprised as to many schools are giving out scholarships. School is where you learn and network is where you connect with people that may or will help you achieve your goals in life. Be sure to network with people because you’ll never know when these people will come in handy. Frugality is just a spare of the moment. Frugality doesn’t mean that you are cheap. It means that you are reasonable with your money and know when to spend or not spend. Being frugal may or will help you build wealth. Let money make money for you. You’ve worked hard enough in the day. So, let money do its magic even while you are asleep. Better yet, invest your time, money, and energy into things that will help you build wealth. There are ways you can do this. One of the best ways is to invest your money in the stock market, real estate, and business ventures. Budget is for everybody and not just for those who don’t have enough money. Budget is a key factor if you want to reach financial independence. Budgeting is not easy but it can or will help you with your financial goals. Don’t park your money in the bank. Inflation rates increase faster than the interest rate in your bank accounts. Invest in the stock market, real estate, or something else to help your money grow. Many people like to automate their bill payments. So, why not do the same thing with saving? It’s fast, convenient, and is likely to help you save more. The Millennial Budget is owned by Stefan. He is from the small Caribbean island of Trinidad & Tobago. He is a young millennial living in the United States pursuing my MBA with a specialization in accounting. He completed my undergraduate studies in May of 2015 with a dual major in accounting and business management. Going out to eat or have a drink with your friends will quickly destroy your budget. It is always cheaper to stay in with friends so instead of going out have everybody pitch-in for a night of entertainment. The rich get richer because they understand that dividends and capital gains, if held for more than one year, are taxed at a lower rate than their salary. Unless you are trying to lift weights workout around your neighborhood. A gym membership can be expensive so cut this cost out by doing activities around the area you live. If you’re still a smoker you know that your habit is expensive and deadly. If extending your life and saving a mountain of money sounds like a good deal to you it is time to stop smoking using whichever method you deem effective. Drinking water has great health benefits as well as financial benefits. Drinking more water before a meal allows you to stay fuller for longer which leads to you eating less. Tip: Buy a reusable water bottle as oppose to bottle water. There are hundreds of credit cards that offer reward programs such as: cash back, points, gas, hotels, airline miles etc. Find a card that suites your spending habits to get the maximum rewards! Generic brands can lead to major cost savings when it comes to groceries and medicine. Many generic brands have the same quality/effects of brand name products. Do not sell stocks whenever the market dips. The best investors know that the most profit is made when the stock market declines as favorable entry points appear. Actively managing a stock portfolio has historically underperformed the S&P 500 over a long-term horizon. Index funds provide diversification and has historically return 7%+ on a yearly basis. If you think you have a green thumb try your hand at gardening. It can be an inexpensive hobby that can reduce your grocery bill with freshly produced food. Robert Erich left his finance job to freelance, travel, and take control of his schedule. He helps others make this transition on his blog MoneyNomad.com with his free series “How to quit your job and become a digital nomad in 90 days“. You can find him on Twitter @rlerich. Make as many purchases as possible through sites like Ebates and Giving Assistant that offer a percentage back. It's free money! Don't leave it on the table. Most hotels and airlines have rewards programs — sign up for them! My favorite is Hotels.com — which offers a free night for every 10 paid across any hotel chain. Don't throw all of your funds in an individual stock. Use a variety of investment tools and platforms to diversify (these are my favorites). If all your friends have BMWs, it's going to be hard to save. However, if your friends are all eager to discuss investing and growing their net-worth, you'll put your money in the right places. It's an amazing book that discusses the mindset of the US wealthy — everyone should read it. Whether that's a blog, freelancing, or a janitorial business, find a hobby that makes money — and then grow it. 37. Use credit cards and pay them off! I've received over $1500 in credit card rewards this past year. The perks that come with paying with plastic are amazing! However, at a 15-20% interest rate, even a small balance can ruin the benefit. So, use cards but never keep a balance. Investing and frugal living now are only enjoyable if you have reasons. It doesn't matter if that reason is early retirement, your kids, or donating to your favorite nonprofit — know and understand the benefit of saving today. Kumiko works in the finance industry by day and is a personal finance/lifestyle blogger by night. She’s a mom to the most beautiful little boy, and wife to her wonderful husband of 4 years. She graduated from Eastern Washington University in 2011 with a business degree, and received her Accredited Financial Counselor® designation in August of 2015. Visit her at The Budget Mom. A lot of people don't realize that saving and budgeting go hand-in-hand. Dumping random amounts into your savings account every so often will not lead to long term saving success. In order to maximize your savings, you first have to know where your money is going and how much you can comfortably save without feeling completely overwhelmed. Make a plan for your money and your savings by learning how to properly budget. One of the biggest impacts you can make on your savings is through automation. We really are our own worst enemy and sometimes it's hard to resist the temptation to spend rather than save. Saving becomes a whole lot easier if you don't have to think about it. Transferring money from your checking into your savings account on paydays works really well. It decreases your chance of spending it and it also allows you to pay yourself first – the golden rule of finance. Trying to save is hard enough, but it's even harder when it's easy to access. Make sure your savings account is held at a different institution from your checking account. The easiest way to save money is by not seeing it. If you have been trying to save and you find your savings account decreasing faster than you can replenish it, moving your savings account might just do the trick. Instant gratification is a huge hurdle to overcome. Waiting 30 days to decide on a purchase is often the best solution. After waiting a month to make a purchase most people find that the urge to buy has decreased and it's a lot easier to resist the temptation. Not only will it save you some money but it will also give you a better perspective on whether you really NEED it and if it's truly worth the money. Let's be honest. In order to save more, you need more money. That doesn't always mean getting a second job or side hustling yourself to death. Use the income you already have and make the most of it. One of the best ways to do this is by reducing debt (most importantly high interest debt). You will be able to save significantly more once you stop paying thousands of dollars every year on interest payments. One of the best ways to accomplish this is by using the Snowball Method. A big portion of your budget goes towards food. Make sure to get a grip on your spending by making a list before you go grocery shopping and stick with it. Make a promise to yourself to never visit the grocery store without one. Make sure to realize your potential and your possibility of making some extra money by turning a hobby into sellable goods. Knitting, photography, scrapbooking, and artwork are all great examples of hobbies that can increase your savings. Nothing stings more than never reaching your saving goals. Having unrealistic goals leads to lack of motivation, which can put a big kink in your finances. Make clear defined goals to increase your chance of saving successfully. Acorns – Do you have CENTS TO INVEST? Now, you can invest as little as $0.01 through Acorns. Acorns will roundup your purchase and invest your spare change. For example, you purchased an item for $9.59. Acorns will round it up to $10.00 and invest the difference, $0.41, to various ETFs? It invests your spare change automatically. If you sign up via this link, you will get $5 BONUS. With Acorns, who says investing is difficult and costly? Not me. It Pays Dividends is a personal finance blog focusing on the pursuit of financial freedom and a remarkable life. It Pays Dividends includes tips, habits, and systems to help you find and achieve the life you want to live. This way you can take more time to make sure you actually want to make that purchase. Many times, you will realize it isn’t as important as you thought it was in that moment. For many items, you can rent them many times and it will still not cost as much as buying it new (for example: campers). If you finance a purchase, be sure to look at the total cost of the item, not the monthly payment. Salesmen are amazing at getting you a nice low monthly payment by extending the duration of the loan just to hide the fact they are increasing the price of the purchase. Plan for how you will utilize extra money that comes in (such as bonuses, gifts, etc) before you actually receive the money (a cash priority plan). There is a better chance you will put that money to a more beneficial use when you aren’t on the emotional high of getting the money. When you come across annoyances or difficulties in a job, put a set amount of money aside to invest to create your “Freedom Fund”. This fund can help you achieve financial independence in the future and obtain your freedom from a paycheck. Aliyyah is the blogger behind the Rich and Happy Blog. She is a twenty-something professional who graduated from college with no debt and is working towards financial independence. You can find more about her on Pinterest, and Twitter. When eating out with friends or family, opt to go out for lunch instead of dinner. I've seen the same items on restaurant menus for $5 to $10 cheaper on the lunch menu rather than the dinner menu. Your credit card balance is reported to credit bureaus once your bill is due. If you want to lower your credit utilization rate, paying off items on your credit card throughout the month will do just that. I've been paying $30 per month for high-speed Internet for the past three years. The trick is to ask for a promotional rate right when your rate for the year is about to end. Internet providers always have promotional rates and are willing to offer them to loyal customers if you just ask. This may be a little tongue-in-cheek, but if you like to drink alcohol, it's a good idea to pre-game before you go out. Simple have one or two drinks before you head to the nightclub or lounge. You'll enjoy your time more and save money on high-priced drinks! It's so important for you to make more money if you want to get ahead. I highly recommend starting a side hustle to make money in addition to your day job. This money can be used to build a buffer in your checking account or pad your savings. Allan, you have a great post here. There is a lot of very helpful information and resources for people to use. I wish had known some of this when I was younger! Nice compilation, everyone! There’s a tip that could work for everyone within these 55 suggestions. Thanks for putting this together Allan! This is an incredible list and I’ll be sure to stop back here in a few months to make sure I’m doing as many of these as I can. This might be a page I have to bookmark. A lot of stuff on here I already do, and some of it isn’t applicable to me, but there are some new things I can try out. My favorite budgeting tip is what you called the “F-you money.” I think a lot of people shoot themselves in the foot by not budgeting for fun expenditures, and then they feel deprived and end up splurging too much when they do spend money on fun. Budgeting for it helps create more realistic expectations and allows you to have some guilt-free fun with less risk of going over budget. Love this – great idea having everyone chime in as well. This year, I could say – was to negotiate everything – any contract you have – internet, insurance, etc.. negotiate. Further, maximize your pre-tax investments – 401k, HSA, Traditional IRA. I may be able to save $7K or so in full taxes this year, simply because of it. Great article! Great tips from amazing bloggers! We have implemented almost all of these tips but we really need to work on our investing beyond our employers 401k plans. I have never read The Millionaire Next Door, but this is at least the third recommendation I have seen so I guess I better check it out. I love the drink more water advice. You will feel better and have more money. So many more clear-headed decisions can happen when you are hydrated. Great stuff, Allan! I especially liked the 30-day rule from The Budget Mom. Thanks for going through all of these blogs and finding all of these tips! This is a nice collection of tips Allan, thanks for sharing! I’m sure that everyone can find something useful that they did not know! great tips. like how in the end it’s different flavor of the same principles 🙂 wonderful to see like-minded people sharing tips and encouraging each other on! thank you for the compilation.